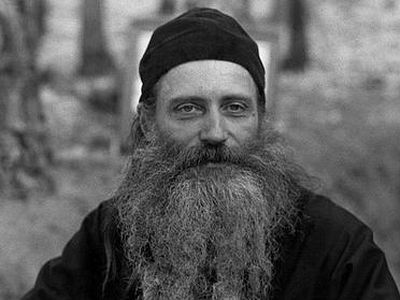 Archpriest Artemy Vladimirov speaks about the purpose, meaning and essence of the Apostles’ Fast; about how we can relate the apostolic ministry in our life—the apostolic gift of word—to our abilities; and about the need to humble ourselves verbally and to spiritualize all of our pronunciations. We differ so greatly between ourselves, isn’t it so? Even Orthodox people think and feel differently. A serene, hot summer has arrived. Behind our backs remains, dear friends, the light-bearing feast of Pascha. On Pentecost, fifty days later, we gathered in our churches, and kneeling, prayed to the Father and to the Son and to the Holy Spirit to grant us the renewing Divine grace. And now, the Apostles’ Fast. Do not, friends, complain about this enactment of our Mother-Church. This fast is absolutely not prolonged, lasting only until July 12. But in order to bear the burden of the Apostles’ Fast, and with all the lovers of God to rejoice at the opportunity to refrain a bit from animal products, let’s be clear about the purpose, meaning and essence of this Church, and that means Divine, establishment. Yes, correct are those who say that this fast was instituted by the entire Catholic Apostolic Church a bit later than Great Lent. But according to the testimony of Venerable Seraphim, all that is accepted and kissed by our Mother-Church should be beloved by every one of her children. In the book of the Acts of the Apostles we read that those Christians hand-selected for the proclaiming of the Gospel by the twelve disciples fasted and prayed and after the imposition of Apostolic hands spread out to every corner of the universe to bring to both near and far the tidings of the Resurrection of Christ. 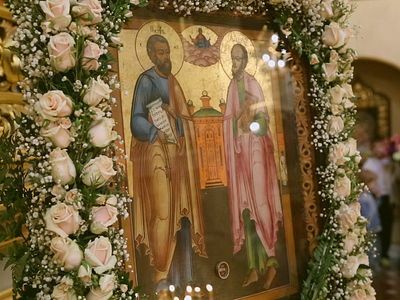 The Peter and Paul, or Apostles’ Fast, is intimately connected with the gift of word which each of us received in excess from birth as a precious attribute of the image of God. And the more so because we in our majority are Slavs, and Slavs are such a tribe and such a people for whom the word is the means by which to glorify the Creator. The Apostles’ Fast is needful for us in order to slightly narrow our bellies—but “a full belly”—as the Russian people bear witness—“is deaf to lessons.” We aroused within ourselves the gift of speech, so that our thoughts—our internal word, residing in the depths of the immortal human soul would be bit-by-bit illumined, and from precipitous, winding, haphazard thoughts, would become as a shining thread directed towards the source of existence—that is, to God, turned into a secret prayer of the heart. Those who come before the face of the Heavenly Father, those who in the privacy of their souls converse with the Word Incarnate, as was proper to those great and spirit-bearing men—the Apostles and their successors, receive an especial grace—a testimony to the Resurrection of Christ—of course, neither in waywardness, nor on our own initiative, but in obedience to the hierarchy. However, every Christian, according to the credentials of the Apostle Peter, should be able to give an account for his hope (cf. 1 Pet. 3:15). By this fast, it seems to me, special attention should be given that all of our actions, even tiny deeds, every step, every verbal act would be conformed to the good, pleasing, and perfect will of God. Better deeds without words than words without deeds, wouldn’t you agree? Words and deeds in conformity, a confirmation of the foundations of our faith and the commandments which we are called to fulfill in relation with our Creator and neighbors, are the most eloquent testimony to the Resurrection of Christ. But reflect upon this: about how many words in a day do we spend communicating with one another? We won’t be mistaken if we say a million, and maybe even more. Meanwhile the Savior, warning us, says that every word empty and vapid and alien to moral sense, devoid of the spirit of truth and love, polluted with deceit, vulgarity, irritability, impurity, pride and hubris leads to the conviction of the bearer of the word. For every word man will give account on the day of the Judgment. In thy name shall they rejoice all the day (Ps. 88:17), as said King David already a thousand years before the Nativity of Christ. The prayer of a man who does this work unhurriedly, with attention, with feeling, with earnest, with order, and firstly—with deep faith and hope on the mercy of God … such a prayer is the easiest, most joyful, and inspiring, bringing internal contentment and bestowing the fullness of being. This summer fast is going out into nature, strolling along the Pakhra or the Desna, contemplating these quiet waters of suburban rivulets, harkening to the rustling of the leaves, beholding the expanse of the heavens as they naturally and joyfully glorify the Lord, Who gifts us with the enjoyment of the four times of year: summer, fall, winter, and spring. Neither with God nor with nature is there any bad weather. Through a prayerful connection with the Creator we remove ourselves for a time from the usual boredom, grief, melancholy and even depression of the townsfolk. Quite the contrary, we feel the surge of life’s vital forces such that we again want to live and pray and toil for the Lord and for the benefit of others. Silence-hesychia, united with prayer, truly refreshing the strength of man both in body and in soul, delivers from stress, from some kind of false rootlessness and moreover gives us a precious reserve of living strength, necessary for fellowship with one another. We are called by the Apostles’ Fast to be evangelists, dispensers of joy and vigor by an active life and dynamism and readiness to do the good which principally distinguishes a Christian from the man who is alien to hope in the almighty and all-merciful God. And we recall that the gift of word is truly a sacred gift, and therefore we will be patient with our blood relatives and household. And we, regrettably, often don’t take care for how to appear “properly”—as is becoming, not hesitating to show some faults, absolutely not emulous of the peculiarities of our nature. Look upon the faces of Muscovites, how in the morning they are not embarrassed to express mutual grievances to their dearest and most beloved. How often from flies there suddenly appears elephants and nonsense which absolutely doesn’t deserve the attention of a wise and intelligent man experienced in life, becoming some diabolic spark, turning into a lamp of strife, recrimination, squabbles, deep offenses, and sometimes even actions not consonant with the dignity of man, coarseness, and everything that flows from it. The Apostles’ Fast is as necessary for us as air. Let’s place before ourselves the secret task of offending none, disappointing none, to be able to smile in a necessary moment, to mitigate another’s invective, some malevolence, the ironic expression of a clever joke, to conduct conversations in a peaceful stream, to comfort those who already do not see the world through the eyes of a child, but are locked up within their own shell and near to desperation. It seems that, no matter how modest this life, man, consistently realizing it, through small things comes to the great. And what is this greatness? It resounds, we’ll say, in such marvelous Biblical words proceeding from the mouth of the prophet, through which the Old Testament people of God spoke and with us speaks God Himself: if thou wilt bring forth the precious from the worthless, thou shalt be as my mouth (Jer. 15:19). This is God’s amazing promise. If someone curses at you or a teenager openly lies, trying to hide his nefarious deeds, but you, as a wise adult, priest, educator, teacher, or just a moral person, reason with such an unbridled thug, conversing with him with a purely literary tongue, avoiding vulgar intonations, computer lingo, slang, and curses which today have the tendency to slip from opposing tongues … you, without realizing it, serve for the enlightenment of his mind, the softening of his heart, and the pacification of a dozen other souls. This is the meaning of words spiced with Divine grace. Let’s recall, this fast, the commandments which the Apostle Paul addresses to us, revolving around human words. “Brothers,” says the preeminent Apostle Paul, “lie not to one another” (cf. Col. 3:9, Eph. 4:25). Indeed, lies are of the devil. The man who fibs as a distraction is quickly bereft of respect and acquires a notorious reputation as a chatterbox who can be trusted with nothing, who doesn’t observe his obligations. Let no corrupt communication proceed out of your mouth (Eph. 4:29). A corrupt word is that word which reeks of decay—which stinks. Obviously it’s a foul, lowly, stylistically low and abusive word. It’s not for me to tell you how bursting at the seams are our spousal unions only because husbands exhibit such gaucheness, not fearing to say such things to their life’s helpmate or children, which withers the ears of people to even the slightest extent decent and mannered. “Let your word,” beseeches the Apostle, “be seasoned with grace, that it might edify its hearer” (cf. Col. 4:6, Eph. 4:29). Grace is love and the desire to serve another and bring to him a true blessing. Today, unfortunately, in the age of indifference, egotism and callousness of hearts, how rarely you hear a word which is addressed precisely to you, a word reflective and benevolent, a word saturated with the energy of love. We take note that such a word cannot be knit. It’s impossible to relate it. It passes through all obstacles. A word which is borne out from the depths of a loving, merciful and prayerful heart is truly winged. Piercing into the innermost recesses of human hearts, it echoes unexpectedly. In men there emerges compassion and trust. Their hearts unfold as flowers towards the word which bears within itself no self-interest, but has as its purpose to soften the heart of man. Fish are one of the earliest Christian symbols. So, we have entered, dear friends, in upon the Peter and Paul Fast. In comparison with Great Lent, it is quite unburdensome. On the majority of days we are suffered to eat fish. “Catch a fish, big and small!” But for us priests, these “fish” are immortal human souls. 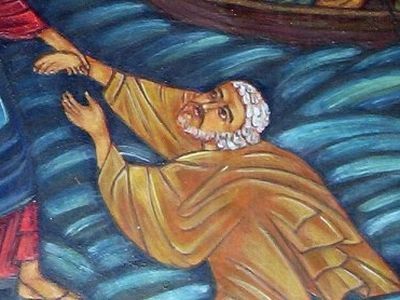 And God grant that we all now, entering into the crystal clear waters of the Apostles’ Fast, would swim against the current, against the spirit of this world, preserving in this sublunary world the clarity of thought, the nobility of aspirations, and “the soul's exquisite raptures,” focusing on the good of our neighbors. This rule of fasting, to be sure, is not intended to be a "straight-jacket" for Orthodox believers, nor a source of pharisaical pride for anyone who keeps the letter of the Church's law. It is rather the rule, the standard, against which each is to measure his own practice, and towards which one must always strive, according to one's strength and circumstances.